Ostrom’s design principles for managing common pool resources were developed largely by examining local commons involving natural resources. This paper enumerates several key characteristics that distinguish such commons from more complex commons involving global resources and the risks of emerging technologies. It considers the degree to which the design principles transfer to those commons and concludes that although they have considerable external validity, the list needs some modification and elaboration to apply to global resources and risk commons. A list of design principles is offered for global resource commons and the risks of emerging technologies. Applying Ostrom’s approach to global resources and emerging technologies can improve understanding and expand the solution set for these problems from international treaties, top-down national regulation, and interventions in market pricing systems to include non-governmental institutions that embody principles of self-governance. Garrett Hardin’s paper, “The Tragedy of the Commons” (1968), challenged, scared, or inspired a generation of people concerned with the integrity of Earth’s natural environments. It appeared at a time when environmental concerns were broadening from local issues to global ones – a time when other major environmental works, such as The Population Bomb (Ehrlich 1968) and The Limits to Growth (Meadows et al. 1972) were getting very serious attention and discussion in policy and academic circles. These works all pointed to similar conclusions: that the global environment was threatened by what seemed to be very fundamental attributes of Homo sapiens: for Ehrlich, our desire to procreate; for Meadows et al., our tendency to expand endlessly the production and consumption of goods and services; and for Hardin, our shortsightedness and our tendency to look out for ourselves first. To save the planet, these works said, humanity would have to find ways to change or curb human nature. These works became touchstones for the modern environmental movement. They inspired a generation of environmental regulations, by which central governments sought to “command and control” human appetites; a generation of policies based on the use of financial incentives to curb the same appetites in ways that sought to be more efficient; and a generation of moral appeals to the “better” parts of human nature. They also inspired a generation of natural scientists to measure, monitor, and model environmental change and a generation of researchers, mostly from the social sciences, to develop a new science of human-environment interactions (e.g. Turner et al. 1990; National Research Council 1992; Stern 1993). For many of the scientists who refused to accept Hardin’s (1968) formulation of a tragedy with no satisfying endings (i.e. a choice between environmental collapse and coercive government), the commons was a compelling riddle – a social trap (Platt 1973), a dilemma (e.g. Stern 1976), or a drama (National Research Council 2002) – not necessarily ending as tragedy. A better theoretical formulation was needed to find more satisfying endings. The point of departure for this paper is the seminal contribution of Ostrom (1990), who defined eight design principles for governing commons. Her breakthrough depended on empirical analyses of a variety of local-scale resource commons, which provide a wealth of histories of failure and success. This paper examines questions of external validity: How well do these principles apply to global resources and common-pool hazards from emerging technologies? What modifications are needed to generate a set of design principles for these commons? It concludes that governance of both global resources and emerging technologies can be studied and understood from a commons perspective and that a set of design principles can be defined for these commons that extend and elaborate Ostrom’s original design principles. Social scientists looked in two directions for empirical test beds for the commons – one more productive than the other. Many, including myself, looked to large-scale and global environmental problems. Energy was a major policy issue in the 1970s, and it provided the frame of reference for some early empirical work on the commons. For example, I developed a laboratory simulation around a small-group interaction that represented the two essential conflicts in a commons – between individual and collective well-being and between short-term resource exploitation and long-term sustainability. The model situation was the choice of commuting alone by car, or with a group in a carpool, in a context of oil resource depletion (Stern 1976, 1977). The simulation produced interesting results, but I had serious questions about validity beyond the laboratory. Face-to-face interaction was easy to arrange in a small group but not in the larger world, and this might make a huge difference (Stern and Kirkpatrick 1977). Supporting this hypothesis, some studies of U.S. energy conservation programs showed more success in programs sponsored by local community groups or municipally owned utility companies than in programs with similar features sponsored by larger and more socially distant entities (Stern et al. 1981; National Research Council 1984). Research on energy as a global commons faded out when the energy crises of the 1970s faded from public memory and, in the US, government support ended for energy conservation programs and for research on them in the early 1980s. They are bounded at local to regional scale, typically the tens to thousands of km2 that comprise a forest or watershed. The appropriators number in the tens to a few thousands. The commons are degraded through intentional action (that is, the conscious purpose of the appropriators is to extract the depletable resource). The appropriators share common interests with respect to maintaining the resource. That is, the people who have an individual incentive to exploit the resource also have a collective incentive to sustain it. Put yet another way, the negative externalities of appropriation remain within the community of users. The appropriators share a common cultural and institutional context. Learning from concrete experience is a feasible management strategy. It is feasible because the depletable resources regenerate on a short enough time scale to make learning possible within the span of human memory and because the relevant properties of the resource system are reasonably stable on that time scale. Several of these characteristics of local commons have previously been highlighted in works addressing the challenges of “scaling up” Ostrom’s 1990 design principles for application to global commons (e.g. McGinnis and Ostrom 1996; Ostrom et al. 1999; Gibson et al. 2000; Ostrom 2002–2003; Dietz et al. 2003). Their importance for defining local commons, however, may not have been evident before the scaling-up question was raised. Local commons provided a rich set of cases with considerable variation on key outcome variables, particularly the success or failure of the appropriators in maintaining the productivity of resource bases for their extractive purposes over time. By comparing the successes and failures, Ostrom (1990) was able to identify eight design principles for successful commons governance, largely by induction. Global natural resource commons do not share the above six characteristics. They also do not provide a large number of successful cases from which design principles could be induced. These commons include global fossil fuel supplies; the global climate and ocean and the “services” they provide to humanity; and air and water quality at large geographical scales. Like Ostrom’s local resources, global resources are threatened with degradation as a result of collective human activity. They differ from local resource commons, however, as follows (see Table 1). Global commons, by definition, are degraded on very large scales. Millions or billions of actors are involved. Much of the degradation is not salient to those responsible, in the sense that it is an indirect effect of their conscious intent. Their private gains – traveling faster, disposing of waste, developing new consumer products for sale, and so forth – are not connected in any readily visible way to the resources they degrade. Much of the degradation results from pollution – disposal of things of no value to the responsible actors and therefore commonly ignored. When commons are global and the effects of degradation are distant, it is especially easy to fail to notice the connection. Collective interests diverge. The group of major resource appropriators is not usually the same as the group of those who stand to lose most from resource degradation. In cases such as climate change, ozone depletion, ocean acidification, and biodiversity loss, the externalities of appropriation are borne mainly outside the community of major users, often by people on other continents or in future generations. Even among appropriators, there are divergent interests. Typically, there is a concentrated group of major appropriators – large organizations such as corporations or government agencies – and many minor and/or indirect appropriators, such as households. With climate change, for example, households in the wealthy countries are collectively responsible for a significant portion of their nations’ emissions through direct energy use and an additional significant proportion through energy use and land cover change that is embedded in consumer products (in the US, for example, see Bin and Dowlatabadi 2005; Gardner and Stern 2008). However, large actors have a much closer relation to the resource degradation because it is mainly they who extract the resources and burn the fossil fuels, so they have strong short-term incentives to continue past patterns of appropriation. A prominent example of these incentives in action is the involvement of elements of the U.S. coal and oil industries in generating opposition to the science of climate change in order to block policies to limit greenhouse gas emissions (Dunlap and McCright 2010). Moreover, many major appropriators are global corporations that can avoid many of the costs of resource degradation to them by moving to other jurisdictions, different resource bases, or different lines of business. The appropriators of global commons come from all cultures, all countries, all political-economic systems, all political ideologies, and so forth. This fact makes it difficult to arrive at common understandings, either of the resource system or of the options for managing it. Learning from direct experience is not a feasible option for global commons management for several reasons. First, many of the commons are non-renewable on human time scales, so there is no second chance. For example, the carbon dioxide emissions that drive climate change continue to do so for at least a millennium after they enter the atmosphere (Solomon et al. 2009), and species extinctions last forever. Second, the resource systems are often much more complicated than most local commons, and harder for those involved to understand. As has been noted elsewhere (Ostrom et al. 1999), global commons often involve interlinked resources (e.g. climate change affects ecosystems). Many of these links can be understood only on the basis of sophisticated scientific analyses. The results of such analyses are often imprecise and uncertain, and it can be very difficult for non-specialists to achieve an understanding that even approximates that of a well-informed scientist (for an elaboration of the challenges of understanding in the case of climate change, see Weber and Stern 2011). Third, the affected resource systems may be changing in ways that make past understandings and experiences misleading as guides to future action. Climate change is again a prime example. Earth is moving into a climate regime that is unprecedented over the past several thousand years (National Research Council 2009). Fourth, learning about system properties from experiences in other places, which is possible with local commons, is difficult with only one planet. Perhaps because of these differences between local and global commons, research on ways to address global resource problems has not drawn extensively on research on local commons. Whereas Ostrom’s work on local commons highlights self-governance, much of the research on governing pollution, energy use, biodiversity, and so forth implicitly accepts Hardin’s Hobbesian (Hobbes 1651) frame. This is the idea that a Leviathan – a central authority, oriented toward the long-term public good, is necessary for controlling numerous private actors (individuals, households, and companies) that are short-sighted, individualistic, and perhaps also ignorant. There are large bodies of research on the operation of command-and-control regulation; on the effects of centralized policies that alter prices and other financial incentives; and on the effects of information, education, and persuasive communication on a wide range of commons-degrading actions in the arenas of energy use and pollution. Most of this work takes a fundamentally different approach from Ostrom’s with regard to Hardin’s dilemma. The implicit purpose of the bulk of the research on large-scale commons is to advise the architects of policies and programs on how best to influence the targets of those policies and programs to fulfill the architects’ purposes. One major exception to this generality proves the rule. In research on international agreements and regimes, an arena where a Leviathan would be a world government and thus infeasible, considerable attention has been given to collective self-governance and to institutional design for this purpose (e.g. Reinicke 1998). This has included studies of institutions involving multiple governments in protecting large-scale and global commons (e.g. Haas et al. 1993; Tietenberg 2002; Young 2002). There have even been some studies of international non-governmental institutions for this purpose (e.g. Prakash and Potoski 2006). Still, for most part, there has been remarkably little communication between commons research in the Ostrom tradition and research on such things as energy conservation, conventional types of air and water pollution, climate change, and ocean acidification. How well do the design principles set out in Governing the Commons (Ostrom 1990) apply to global resource commons? What kinds of modifications to the principles might give them improved applicability to global resources? Which of the differences between local and global common-pool resources are most responsible for the relative paucity of success cases in the latter arena? To what extent are the conclusions from research on the local common-pool resources consistent with those of research on global commons? What insights can knowledge about local commons add to what has already been learned about large-scale commons? Ostrom and her colleagues began reflecting in the 1990s on how well the design principles induced from the study of local commons apply to global commons (e.g. McGinnies and Ostrom 1996; Ostrom et al. 1999). In 2000, the U.S. National Research Council’s Committee on the Human Dimensions of Global Change took up this question in some detail, leading to the volume The Drama of the Commons (National Research Council 2002) and further synthetic work (Stern et al. 2002; Dietz et al. 2003). The National Research Council project looked at commons at various scales. It invited contributions from researchers who had examined the governance of commons from the local to the international levels and explicit analyses of cross-scale connections. It sought to arrive at design principles that appeared applicable to global-scale commons. One result of extending the scope of attention beyond small-scale commons was the idea that different commons-management situations can present different governance challenges, so that depending on the key challenges, the most important design principles may change, with some of them being applicable or relevant only in some kinds of situations (Stern et al. 2002). For example, establishing clear boundaries around the appropriators or the resources is meaningful with local commons, but much less so with global markets for oil and natural gas or with ocean acidification or global warming. These investigations suggest that global commons raise special challenges for implementing the eight 1990 principles and that the principles for governing them may not be identical to those that apply to local resources. The eight principles are discussed in turn (see Table 2). Defining boundaries for resources and appropriators is not a meaningful exercise for global commons, even though it is possible to treat political jurisdictions as boundaries for the enforcement agreements made by sovereign authorities. Devising rules congruent with ecological conditions does not make immediate sense for global commons. The ecological conditions of the planet are so many as to be impractical to specify, and enforcing rules globally seems an insurmountable challenge absent any global sovereign authority. Nevertheless, an example suggests that the principle is applicable. One important condition of the global climate is the irreversibility on human time scales of the effects of carbon dioxide emissions. In recognition of this condition, it has been suggested that instead of setting emissions goals for some future target year as is commonly done in making policy commitments, policies should be organized to keep actors within long-term (e.g. 40-year) carbon emission budgets (see, e.g. National Research Council 2010c). Allowing most users to participate in developing the rules is a huge challenge if one treats the entire human population as the users. The fact that the benefits and costs of degradation fall to largely different groups virtually ensures conflict in any particular governance context. The design principle needs to be unpacked: Which groups of users should be involved in making which rules? And if the major degraders have incentives to externalize much of the cost, what would get them to design rules that would protect the commons? There is also the issue of how “most users” can participate meaningfully when there are so many, and when the system is so complex as to challenge the understanding of even the most expert scientists. Because of these challenges, the design principle needs to be rephrased for global resource commons: Ensure meaningful participation of the range of interested and affected parties in developing rules. It is often difficult to provide for meaningful participation, but a large body of research on public participation suggests effective processes for implementing the revised principle (National Research Council 2008a). Holding monitors accountable to users is a principle that is as important for global commons as for local, but much more difficult to implement. First, there is the conflict of interest between the major appropriators, who are in the best position to monitor resource use but who have an incentive to underreport, and the bulk of the affected parties, to whom monitors should be responsible. Because of this, independence of monitors from appropriators is important for the design of institutions for such purposes as allocating carbon offsets and implementing carbon labels (Vandenbergh et al. 2011). Still, implementation presents strong challenges when the governance institutions rely on appropriators to provide funds or essential information for monitoring efforts. Second, monitoring has to be global to avoid “leakage”, such as the off-shoring of activities that damage global commons. Third, when global markets are involved it is not always clear whose activities or which activities are most important to monitor. With climate change, for example, allocating fossil fuel consumption to the actors according to how much fossil fuels they burn yields a very different distribution of responsibility from allocating it to actors according to how much fossil fuel burning occurs in producing the goods and services they use (Davis and Caldeira 2010; Vandenbergh et al. 2010). Also, climate change degrades many different commons in different ways, but attribution of the degradation to climate change is not easy. For some resource conditions, monitoring is technically difficult and requires expensive and highly technical equipment. Moreover, the potential rule violations could involve individuals or organizations anywhere in the world and their uses of energy, land, water, consumer products, and even money. The accountability and monitoring principle needs some modification and elaboration to apply to global resources: Establish independent monitoring of the resource and its use that is accountable to the interested and affected parties. Doing this requires, among other things, conducting research to determine what needs monitoring and how to do it. Graduated sanctions and low-cost conflict resolution are probably as important with global commons as local, but are more difficult to implement. The parties in conflict are likely to live in different countries with different legal and political systems, and may live in different centuries. How to sanction under such circumstances is a major challenge. The relationships among levels and domains of authority pose additional critical challenges for governing global commons. Ostrom identified two relevant design principles: having higher-level authorities permit resource users to devise their own rules, and having nested layers of organization (an element of “polycentric governance”, Ostrom 2010). Implementing these principles is very difficult with global commons and can even be counterproductive. The most difficult problems arise because lower-level governments, companies, or other users have incentives and opportunities to externalize the costs of the resource degradation they cause. To meet this challenge, it may be necessary to restrict local autonomy in some ways while allowing it in others, or to devise institutional forms that give local users incentives to self-govern in the wider interest. For example, Prakash and Potoski (2006) have examined ways that a corporation’s reputation among customers and competitors can function as a resource that it will invest to protect by complying with extra-governmental agreements to follow costly practices for environmental protection. Institutions that globally publicize good and bad commons management practices can influence even large multinational corporations, even without regulatory authority, by affecting their reputations with customers and investors. Another challenge is that lower-level actors may not have the knowledge or other resources to take commons-protective action without help. A good example is households’ efforts to reduce their greenhouse gas emissions. Households often have mistaken impressions of which actions have the greatest impact (e.g. Attari et al. 2010); lack access to funds for investing in energy efficient technologies; and face major obstacles in terms of the cognitive effort required to make well-informed decisions, find competent technical help, and take advantage of existing financial incentives (e.g. Gardner and Stern 1996; Stern 2008; Stern et al. 2010; Vandenbergh et al. 2010). Higher-level actors can help them overcome these barriers by providing information and implementing programs designed to reduce cognitive burdens and overcome other barriers. Simply permitting lower-level actors to make their own rules is not sufficient. The same is true for adapting to climate change. Much of adaptation is local, but it can be hard for local actors with limited scientific expertise and funds to determine which adaptive actions will best achieve their objectives. They need “decision support” and other assistance from higher-level entities to facilitate adaptation (National Research Council 2008b, 2009, 2010b, 2010c), and help finding others’ experiences to learn from. In sum, Ostrom’s design principle needs modification to be applied to global resource commons: Higher-level authorities should facilitate lower-level actors to devise rules by delegating authority as needed and by providing access to necessary knowledge and other resources. designing institutions to allow for adaptation. These governance requirements suggest a few additional design principles, some of them previously identified in the literature (Dietz et al. 2003), that are particularly relevant for commons at very large scales. Invest in science to understand the resource and its interactions with users and those affected by its use. Global resource commons are normally characterized by seriously inadequate knowledge of the resource system (Wilson 2002) and its human dimensions (National Research Council 1992). When this condition arises, for example, with climate change, monitoring, sanctioning, and conflict resolution are all more difficult. Investments in science can help improve understanding of the system and its interactions with users so that those affected by its changes know what to monitor and sanction. As suggested above, some of the investments in science may need to come from sources other than the resource users themselves. Integrate scientific analysis with broadly based deliberation. When the operation of a resource system is imperfectly understood, it is hard to be sure which of its parameters are most important to monitor, which norms of resource use to emphasize, which violations deserve the most serious sanctioning, and so on. Under uncertainty, resource users may be tempted to act as if the most optimistic projections for the resource are valid, with the result that there is a pressure for undue risk acceptance that presents an additional challenge for governance. Parties with different interests and values typically offer competing interpretations of imperfect knowledge. In addition, much of the production of science may be controlled by actors that have private interests or that are not trusted by users of the science to meet these challenges. Thus, it is important to integrate cutting-edge science into the governance regime in ways that make the scientists, as well as the appropriators and monitors, accountable to the wider set of parties affected by the resource-use regime and that engage them in making rules by interacting with interested and affected parties in what have been called analytic-deliberative processes (National Research Council 1996, 2008a, 2009; Dietz and Stern 1998). These processes involve well-structured dialogue among scientists, resource users, and interested publics to provide credible information, build trust in it, consider its import for resource management, increase social capital, and provide a basis for adaptation and change. Plan for institutional adaptation and change (iterative risk management). Uncertainty about the resource, evolving science, and the possibility that the best scientific information may suggest different kinds of action at different times increase the importance of having governance regimes that are adaptive to changing information, including scientific information. Even if resource users are able to update their rules, they may not be in a position to update the science on their own. Adaptiveness in governance systems, sometimes called iterative risk management (National Research Council 2011), is therefore an important design principle. Among the key challenges of iterative risk management are designing institutions to learn rather than to simply follow standard operating procedures (possibly by making reconsideration into a routine) and incorporating science into organizational learning processes. Engage a variety of institutional forms. Institutional variety, along with nested layers of organization, is a fundamental principle of polyarchy as described by Ostrom (2010). However, it was not highlighted as a design principle in Governing the Commons, possibly because it is not a salient feature of the successful local commons institutions that informed that work. With global resources, however, this feature of polyarchy deserves explicit attention as a governance principle (Sovacool 2011). There is room for command-and-control, market-based, and informal forms of influence in governance of global resources. The challenge is to find combinations of institutional forms that can effectively implement the other design principles. An example of the challenge is the effort to embed local forest management institutions in a global regime for reducing greenhouse gas emissions from deforestation and degradation (REDD). International organizations are working from the top down to establish protocols for measuring and monitoring emissions reductions and rules for a market for carbon credits that will determine who can receive payments and provide incentives for sustainable forest management. For these regulatory and market-based interventions to be successful, they must be integrated with the national and local formal and informal institutions that now shape forest use. REDD is an experiment in seeking ways to effectively integrate institutional forms. Invest in science to understand the resource and its interactions with users and those affected by its use. Establish independent monitoring of the resource and its use that is accountable to the range of interested and affected parties. Ensure meaningful participation of the parties in framing questions for analysis, defining the import of scientific results, and developing rules. Integrate scientific analysis with broadly based deliberation. Higher-level actors should facilitate participation of lower-level actors. Engage and connect a variety of institutional forms from local to global in developing rules, monitoring, and sanctioning. Plan for institutional adaptation and change. These principles are derived from the large body of research on local resource commons, analysis of the differences between the smaller-and-simpler and the large and complex commons, and a small amount of empirical research on global resource commons. They do not diminish the relevance of some other design principles identified by Ostrom, such as the use of graduated sanctions, low-cost conflict-resolution mechanisms, and rules congruent with ecological conditions. Although they are not yet solidly established or strongly tested, they show the value of Ostrom’s approach as a heuristic and a source of reasonable and testable hypotheses about governance issues outside the original empirical base for the theory. New and emerging technologies often present commons problems, many of them global, when their implementation creates externalities in the form of risks of harm to parties beyond the set of users: common-pool hazards. As with natural resources, degradation is the source of the commons problems; however, the degradation mainly results not from extracting desired goods from common pools but from adding undesirable “bads,” such as chemicals, invasive organisms, or forms of energy (e.g. radioactivity). Instead of reducing the supply of a resource, appropriators increase common-pool risks. What is at risk may be the health of human populations exposed to toxic or radioactive byproducts of a technology’s product chain, the viability of non-human populations or ecosystems, or the ability of human communities and individuals to make certain choices for themselves. With new and emerging technologies, it may not even be clear in advance what is at risk. An extreme example is the possibility of inserting substances into the upper atmosphere to reflect incoming solar radiation and thus counteract the effects of greenhouse gas emissions on the global climate. This strategy of climate “geoengineering,” often called solar radiation management, promises to provide a public good by counteracting an ongoing global commons problem. But its full consequences for the planet are very far from fully understood (National Research Council 2010a). The global scientific community has taken note of the risks and of the fact that a governance regime is needed to manage them (Royal Society 2009). Risk governance has long been a subject of research and analysis, but the Ostrom tradition has not yet been well integrated into the risk literature. For example, a recent extensive work on Risk Governance (Renn 2008) includes no reference to Ostrom’s work in a 60-page reference list. Yet there are convergences of these literatures. This section considers the management of risk from emerging technologies from a global commons perspective and concludes that this approach has contributions to offer that extend or refine the contributions of other lines of research – and vice versa. The risks and governance challenges with emerging technologies are both similar to and different from those posed by global resource commons. Emerging technologies are like large-scale resource commons in the complexity of choices, multidimensionality of risk, scientific uncertainty, value conflict and uncertainty, long time horizons, difficulty of excluding actors from taking action, high stakes, potential for mistrust, and time pressure (Dietz and Stern 1998; National Research Council 2005; Stern et al. 2009). These similarities suggest that conclusions that apply to global resources may also apply to governance of technological risks. 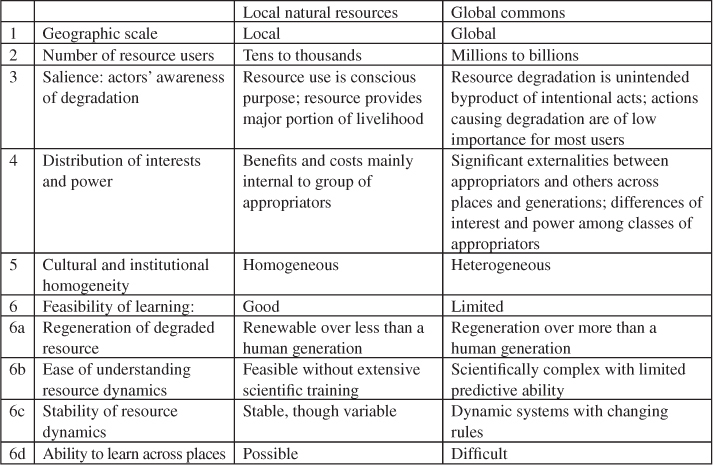 In terms of the categories listed in Table 1, however, a few differences between emerging technologies and global resources are noteworthy in addition to the differences of focus between maintaining resources and limiting risks and between controlling appropriations from and introductions to environments. One is in the ways technological risks are global. Some of them are global in the same systemic way as climate change: they alter integrated physical or biological systems that operate globally. Proposals for geoengineering by solar radiation management provide an example. Similarly, biotechnology can potentially produce new species of life that alter ecosystems globally. Other emerging technologies are distributed globally but are not systemic in this way. For example, the operation of nuclear power stations creates hazards wherever it occurs. The effects are mainly local, but they could happen anywhere because the technological know-how and the relevant markets are global. A second difference is the centrality of irreversible processes in technological development. Natural resource systems have tipping points past which they shift irreversibly into a new state, but for the most part, they do not cross such thresholds. With technological innovation, irreversibility is the norm: technological genies cannot be put back in their bottles. Because of this, adaptive management approaches that rely on continual monitoring of environmental conditions and subsequent adjustment of rules are likely to be inadequate. There is a need to anticipate risks and to institute governance rules before changes in environmental conditions can be observed. Institutions to anticipate risks and minimize them in advance are common with oil, chemical, and biomedical technologies, with nuclear power development and waste disposal, and with recombinant DNA research, and are being considered for nanotechnology, synthetic biology, and climate geoengineering. The need for anticipation results in a third difference from resource commons: the greater importance of scientific complexity, uncertainty, and ignorance as issues in choices involving technologies. This is especially the case with new technologies, the risks of which are by their nature imperfectly known until the technologies have been widely deployed for some time. The importance of science creates challenges for implementing the principle of involving most of participants in developing rules. Anyone may be affected by technological risks, so everyone has a stake in governance, but to participate meaningfully in governance, it may be necessary to understand cutting-edge science or engineering or the results and limitations of complex system models. It does not always take formal training to observe and monitor a forest, fishery, or water source, but it does to make an informed choice about whether to accept the siting of a nuclear power plant, approve an experiment in synthetic biology, or accept a regulatory regime for a nanomedicine product. Because of the knowledge barriers facing self-governance of technological hazards by the affected parties, it is not surprising that decisions are normally made by elites, advised by technical experts. But experience shows that when designated experts make technological choices on behalf of affected populations or all of humanity, their choices are not necessarily widely accepted as legitimate, and they may even neglect important decision relevant information that is known to others (National Research Council 1996). Thus, governing technological risks requires institutions that ensure that the interests and values of all those facing common-pool hazards are involved in developing governance rules and in making decisions, even if most of those individuals cannot be meaningfully involved. Related to the challenges of coping with complex and imperfect science is a fourth difference: the prominence of strong conflicts of values in this domain. Some technological risks generate strong affective reactions among people who do not create, but potentially bear the risks. People commonly react to “dread” or unknown risks much differently than they do to risks with different qualitative characteristics (Slovic 1987), and these reactions, which commonly arise with new and unfamiliar technologies, can affect willingness to trust expert analysts and official decision-making organizations (Pidgeon et al. 2003). Technological risks can also engage deep personal or community values and create conflict between groups whose value priorities are sharply different. This has been the case with advances in biotechnology and with technologies that threaten ecological systems (e.g. Dietz and Stern 1998). A fifth difference is the prominence of conflicts of interest in the governance of technological risk. The benefits of risky technologies are often highly concentrated among a few developers and major users, who usually bear only a small proportion of the risks. Because of strong conflicts of values and interests, low-cost conflict resolution mechanisms are hard to identify for some emerging technologies. These differences from global resource commons are more of degree than of kind. Climate change, for example, partakes of all five of these characteristics to some extent. But the centrality of these issues to the management of technological risks has influenced thinking in ways that provide useful insights about governance that complement those that have emerged from the study of local natural resources. Some of the additional design principles proposed here have their intellectual roots in risk governance. Scientific information and the need for anticipatory governance are so obviously critical to well-informed technological risk management that the relevant community has made investment in science, in the form of formal risk analysis, foundational to governance. It has also traditionally drawn a sharp line between risk assessment and risk management, in part to protect the independence of the scientific analysis from the influence of well-resourced interested parties who seek to exploit new technologies while minimizing or externalizing the common-pool risks (e.g. National Research Council 1983). However, scientific uncertainty and conflicts of values and interests make such a clear separation infeasible. Participants in decision making inevitably act in an environment of imperfect scientific understanding of the risks and must consider the available scientific information in light of their value priorities. The concept of analytic deliberation involving the interested and affected parties (National Research Council 1996; Stern 2005), which is applied here to global resource commons, originated in careful analyses of the limitations of formal risk analytic techniques. Work on analytic deliberation elaborates significantly on the principle of allowing most users to participate in developing rules. It helps identify the points in decision processes at which it is most critical to have the interested and affected parties involved in order to frame the scientific questions that require analysis, interpret the scientific findings, and reconsider the decisions from time to time in light of new experience and information (see National Research Council 2008a, for fuller discussion). It also offers insights on how to involve the parties or represent their interests and values when they may be a global community, how to get meaningful participation when the decision can turn on scientific and technical details that even experts do not fully understand, and how to be adaptive when the decision making authorities may be routine-bound bureaucratic organizations (National Research Council 2008a). Research on the commons also has contributions to make to understanding risk governance. For example, the principle of institutional variety, particularly the inclusion of non-governmental organizations in institutional designs (e.g. Prakash and Potoski 2006), has significant and little-explored potential for risk governance. Possibilities include citizen monitoring of hazards with inexpensive sensors and cellular technology, with the data compiled by non-governmental organizations; development of rating systems and labels for consumer products and technologies to enable sanctioning by consumers through their purchasing behavior (e.g. Vandenbergh et al. 2011); and informal sanctioning through emerging communications media and nongovernmental organizations that can affect the reputations of norm violators. More research is needed to explore such possibilities, elaborate the insights that may emerge, and refine the relevant design principles. Studies of technological risk governance can be a productive venue for such research, leading toward a more general theory of commons governance. It is worth noting that in the context of the International Risk Governance Council, recent work is identifying different types of emerging technological risks and the governance challenges they present, and is proposing management guidelines that are effectively design principles (see, e.g. North 2011). Some of these principles, though derived from experience in very different domains from the ones Ostrom studied, bear a strong family resemblance to some of Ostrom’s principles. The similarities and differences provide interesting avenues for further investigation. Ostrom’s pioneering work in Governing the Commons has considerable relevance for commons that are quite different from those she studied. Although this work has considerable external validity, it does not transfer directly to applications to global resource commons and to technological risks. A general theory of commons governance must incorporate insights from the study of various kinds of commons, and the design principles that were the core of the 1990 work require some modification and extension for other applications. However, Ostrom’s institutional analysis approach and its focus on self-governance institutions seems to have useful lessons to teach to those involved in governing larger commons, who often pay insufficient attention to the potential of such institutions. One of the enduring contributions of Governing the Commons to the problems of global commons and emerging technologies can be an expansion of thinking beyond the usual policy approaches of regulatory command and control, government intervention in market pricing systems, and formal agreements among national sovereigns. I wish to thank Erling Berge and two anonymous reviewers for their helpful comments on earlier drafts. Attari, S. Z, DeKay, M. L, Davisdon, C. I and Bruine de Bruin, W (2010). Public Perceptions of Energy Consumption and Savings. Proceedings of the National Academy of Sciences 107: 16054–16059. Davis, S. J and Caldeira, K (2010). Consumption-based Accounting of CO2 Emissions. Proceedings of the National Academy of Sciences 107: 5687–5692. Dietz, T and Stern, P. C (1998). Science, Values, and Biodiversity. Bioscience 48: 441–444. Dietz, T, Ostrom, E and Stern, P.C (2003). The Struggle to Govern the Commons. Science 302: 1907–1912. Dunlap, R. E and McCright, A , ; Climate Change Denial: Sources, Actors, and Strategies. In: Lever-Tracy, C ed. , editor. Routledge Handbook of Climate Change and Society. New York: Routledge, 2010. p. 240.-260. Ehrlich, P , . The Population Bomb. New York: Ballantine Books. 1968. Gardner, G. T and Stern, P. C , . Environmental Problems and Human Behavior. Boston: Allyn and Bacon. 1996. Gibson, C. C, Ostrom, E and Ahn, T. K (2000). The Concept of Scale and the Human Dimensions of Global Change: A Survey. Ecological Economics 32: 217–239. Haas, P. M, Keohane, R. O and Levy, M. A , . Institutions for the Earth: Sources of Effective International Environmental Protection. Cambridge, MA: MIT Press. 1993. Hardin, G (1968). The Tragedy of the Commons. Science 162: 1243–1248. Hobbes, T , . Leviathan. London, 1987: Penguin. 1651. McGinnis, M and Ostrom, E , ; Design Principles for Local and Global Commons. In: Young, O. R ed. , editor. The International Political Economy and International Institutions, Vol. 2. Brookfield, VT: Edward Elgar, 1996. p. 465.-493. Meadows, D. H, Meadows, D. L, Randers, J and Behrens III, W. W , . The Limits to Growth. New York: Signet. 1972. National Research Council. Risk Assessment in the Federal Government: Managing the Process. Washington, DC: National Academy Press. 1983. Stern, P. C and Aronson, E eds. , editors. National Research Council. Energy Use: The Human Dimension. Committee on Behavioral and Social Aspects of Energy Consumption and Production. New York: Freeman. 1984. Stern, P. C, Young, O. R and Druckman, D eds. , editors. National Research Council. Global Environmental Change: Understanding the Human Dimensions. Committee on the Human Dimensions of Global Change. Washington, DC: National Academy Press. 1992. Stern, P. C and Fineberg, H. V eds. , editors. National Research Council. Understanding Risk: Informing Decisions in a Democratic Society. Committee on Risk Characterization. Washington, DC: National Academy Press. 1996. Ostrom, E, Dietz, T, Dolsak, N, Stern, P. C, Stonich, S and Weber, E eds. , editors. National Research Council. The Drama of the Commons. Committee on the Human Dimensions of Global Change. Washington, DC: National Academy Press. 2002. Brewer, G. D and Stern, P. C eds. , editors. National Research Council. 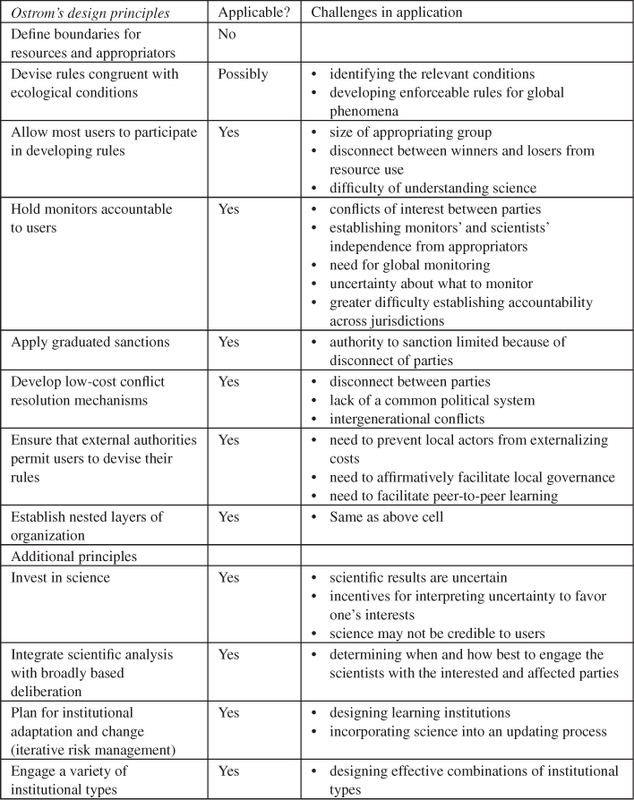 Decision Making for the Environment: Social and Behavioral Science Research Priorities. Washington, DC: National Academy Press. 2005. Dietz, T and Stern, P. C eds. , editors. National Research Council. Public Participation in Environmental Assessment and Decision Making. Panel on Public Participation in Environmental Assessment and Decision Making. Washington, DC: National Academy Press. 2008a. Ingram, H. M and Stern, P. C eds. , editors. National Research Council. Research and Networks for Decision Support in the NOAA Sectoral Applications Research Program. Washington, DC: National Academy Press. 2008b. National Research Council. Informing Decisions in a Changing Climate. Panel on Strategies and Methods for Climate-Related Decision Support. Washington, DC: National Academies Press. 2009. National Research Council. Advancing the Science of Climate Change. Panel on Advancing the Science of Climate Change. Washington, DC: National Academies Press. 2010a. National Research Council. Informing an Effective Response to Climate Change. Panel on Informing Effective Decisions and Actions Related to Climate Change. Washington, DC: National Academies Press. 2010b. National Research Council. Limiting the Magnitude of Future Climate Change. Panel on Limiting the Magnitude of Future Climate Change. Washington, DC: National Academies Press. 2010c. National Research Council. America’s Climate Choices. Committee on America’s Climate Choices. Washington, DC: National Academies Press. 2011. Ostrom, E , . Governing the Commons: The Evolution of Institutions for Collective Action. New York: Cambridge University Press. 1990. Ostrom, E (2002–2003). Managing Resources in the Global Commons. Journal of Business Administration and Policy Analysis 30–31: 401–413. Ostrom, E (2010). Polycentric Systems for Coping with Collective Action and Global Environmental Change. Global Environmental Change 20: 550–557. Ostrom, E, Burger, J, Field, C. B, Norgaard, R. B and Policansky, D (1999). Revisiting the Commons: Local Lessons, Global Challenges. Science 284: 278–282. Pidgeon, N, Kasperson, R. E and Slovic, P eds. , editors. The Social Amplification of Risk. Cambridge: Cambridge University Press. 2003. Platt, J (1973). Social traps. American Psychologist 28: 641–651. Prakash, A and Potoski, M , . The Voluntary Environmentalists: Green Clubs, ISO 14001, and Voluntary Environmental Regulations. New York: Cambridge University Press. 2006. Reinicke, W. H , . Global Public Policy: Governing without Government?. Washington, DC: Brookings Institution. 1998. Renn, O , . Risk Governance: Coping with Uncertainty in a Complex World. London: Earthscan. 2008. Royal Society. Geoengineering the Climate: Science, Governance, and Uncertainty. London: The Royal Society. 2009. Slovic, P (1987). Perception of Risk. Science 236: 280–285. Solomon, S, Plattner, G.-K, Knutti, R and Friedlingstein, P (2009). Irreversible Climate Change Due to Carbon Dioxide Emissions. Proceedings of the National Academy of Sciences 106(6): 1704–1709. Sovacool, B. K (2011). An International Comparison of Four Polycentric Approaches to Climate and Energy Governance. Energy Policy 30: 3832–3844. Stern, P. C (1976). Effect of Incentives and Education on Resource Conservation Decisions in a Simulated Commons Dilemma. Journal of Personality and Social Psychology 34: 1285–1292. Stern, P. C (1977). Psychological Research and the Steady State Society. Population and Environmental Psychology Newsletter 4(2): 10–15. Stern, P. C (1993). A Second Environmental Science: Human-Environment Interactions. Science 260(5116): 1897–1899. Stern, P. C (2005). Deliberative Methods for Understanding Environmental Systems. BioScience 55: 976–982. Stern, P. C , ; Environmentally Significant Behavior in the Home. In: Lewis, A ed. , editor. The Cambridge Handbook of Psychology and Economic Behaviour. Cambridge: Cambridge University Press, 2008. p. 363.-382. Stern, P. C and Kirkpatrick, E. M (1977). Energy Behavior. Environment 19(9): 10–15. Stern, P. C, Black, J. S and Elworth, J. T , . Home Energy Conservation: Issues and Programs for the 1980s. Mount Vernon, NY: Consumers Union Foundation. 1981. Stern, P. C, Dietz, T, Dolsak, N, Ostrom, E and Stonich, S , ; Knowledge and questions after 15 years of research. In The Drama of the Commons, by National Research Council, Committee on the Human Dimensions of Global Change. In: Ostrom, E, Dietz, T, Dolsak, N, Stern, P. C, Stonich, S and Weber, E eds. , editors. Washington, DC: National Academy Press, 2002. p. 445.-489. Stern, P. C, Gardner, G. T, Vandenbergh, M. P, Dietz, T and Gilligan, J (2010). Design Principles for Carbon Emissions Reduction Programs. Environmental Science & Technology 44: 4847–4848. Turner, B. L. II, Clark, W. C, Kates, R. W, Richards, J. F, Mathews, J. T and Meyer, W. B , . The Earth as Transformed by Human Action: Global and Regional Changes in the Biosphere over the Past 300 Years. Cambridge: Cambridge University Press. 1990. Vandenbergh, M. P, Stern, P. C, Gardner, G. T, Dietz, T and Gilligan, J (2010). Implementing the Behavioral Wedge: Designing and Adopting Effective Carbon Emissions Reduction Programs. Environmental Law Reporter 40: 10545–10552. Vandenbergh, M. P, Dietz, T and Stern, P. C (2011). Time to Try Carbon Labeling. Nature Climate Change 1: 4–6. Wilson, J , ; Scientific Uncertainty, Complex Systems, and the Design of Common-Pool Institutions. In The Drama of the Commons, by National Research Council, Committee on the Human Dimensions of Global Change. In: Ostrom, E, Dietz, T, Dolsak, N, Stern, P. C, Stonich, S and Weber, E eds. , editors. Washington, DC: National Academy Press, 2002. p. 327.-359. Young, O. R , ; Institutional Interplay: The Environmental Consequences of Cross-Scale Interactions. In The Drama of the Commons, by National Research Council, Committee on the Human Dimensions of Global Change. In: Ostrom, E, Dietz, T, Dolsak, N, Stern, P. C, Stonich, S and Weber, E eds. , editors. Washington, DC: National Academy Press, 2002. p. 263.-291.